Prahost use geographically separated core routers they are interconnected to our datacetners in Amsterdam - Netherlands, Frankfurt, Dusseldorf - Germany, UK and U.S.
PraHost offers you the Dedicated Server, also known as bare metal servers is actually a physical server that is managed by us and is utilized exclusively for your website, ecommerce, gaming or streaming project. 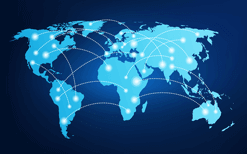 We use geographically separated core routers they are interconnected to our datacetners in Amsterdam - Netherlands, Frankfurt, Dusseldorf - Germany, UK and U.S. which offer you uptime of 99.98% and bandwidth over 5.5 TBps. Our dedicated servers are located in top-tire, iso certified data centers across the globe to offer first-class connectivity to all European, Asia, U.S. access and network providers. We use branded hardware's for Germany and Netherlands servers from some of the leading names in the industry like Cisco, HP and Intel. All servers are customizable for Memory, HDD, Bandwidth and Port Speeds with a choice of reliable and fast Intel processors along with 4GB to 256GB RAM and bandwidth ranging from 10TB, 100TB and unmetered with 100Mbps, 1Gbps and 10Gbps port. If you have an Ecommerce or mission critical website, a PraHost Dedicated Server is the ideal choice for you. Located at EvoSwitch datacenter in Amsterdam, Netherlands. Servers comes with 3 different bandwidth plans to choose with 24x7 support and customizable hardware. Hosted at Telehouse datacenter in Frankfurt and Equinix datacenter in Dusseldorf, Germany. Servers are covered by our SLA and offers you 99.98% uptime. Hosted at level 3 datacenter in Coventry and blusesquare datacenter in Maidenhead. They are connected to multiple 10GB/s uplinks and provide 24x7 support. Why Should you Choose Prahost Bare Metal server hosting? 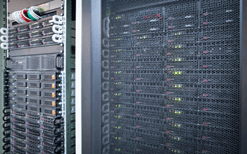 Our servers are located in secured ISO certified data centers. As a result, you are assured of security, efficiency as well as resiliency. PraHost offers you fully customizable netherlands dedicated servers. Hardware upgades can be done with minimum downtime. We use enterprise-class technologies and server grade hardware's. They are designed to manage the most demanding processing tasks and workloads. Our inventories are vast, and for these reason, we can provision dedicated servers in 2hr - upto 5 working days from single server to multiple servers. We have made control very easy with an intuitive customer portal that allows you to control every aspect of your server in one interface.